Ballarat is Victoria’s largest and grandest inland city. It is also home to the most prominent political rebellion on the gold fields, the Eureka Stockade of December 1854. 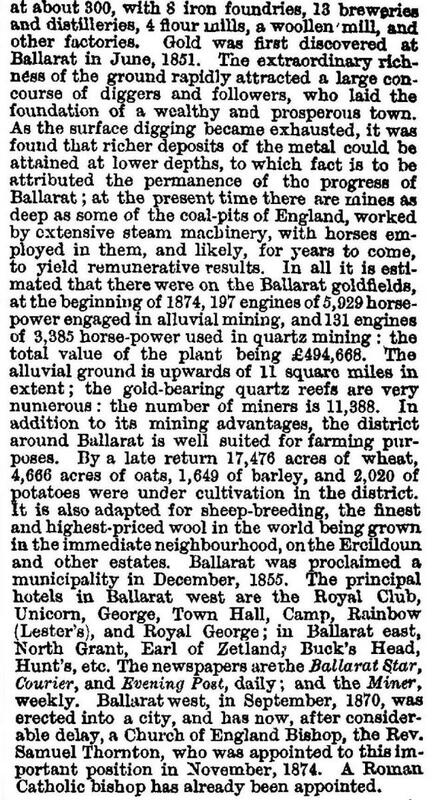 A product of the gold rushes, by 1871 Ballarat boasted a population of almost 50,000, from many parts of the world, well over twice that of its nearby rival, Bendigo. From the 1860s to the 1930s it revelled in being Australia’s largest inland city, with notable bluestone buildings, most of which survive to this day. One of the reasons why so much of the city’s built heritage survives is that with the closure of all its mines by 1918, population growth stalled, so there was little demand for redevelopment of the inner city. New industries took up some of the slack, but Ballarat didn’t get a fully-fledged university until 1994, subsuming a College of Advanced Education and a little later the Ballarat School of Mines and Industries, founded in 1870. Within an hour and a half’s drive of almost all of the Melbourne metropolitan area, Ballarat’s Sovereign Hill Historical Park, opened in 1970, is visited by almost all primary school children in the state, as well as interstate and overseas visitors, giving it the highest number of paying visitors of any tourist attraction in Victoria. Ballarat is on the Western Freeway, 100 km north-west of Melbourne. It was named after a pastoral run taken up by William Yuille in 1838. It is thought that the name was derived from Aboriginal words meaning resting on one's elbow or resting place. As the words were expressed as 'balla' and 'arat', the name has been spelled as Ballaarat, which was the form adopted for the municipality (1855-1994). In July-August 1851, gold was discovered at Clunes and Buninyong. James Regan, a Buninyong prospector, found gold a few weeks later near Golden Point, about midway between the Yarrowee River and the Sovereign Hill Historical Park. Extensive diggings soon developed in the adjoining areas later known as Ballarat East. The area of the diggings can be generally traced from the irregular and curving streets, in contrast to the surveyed township (1854) west of the river, initially bounded by Lydiard, Main, Doveton and Dana Streets. The Ballarat diggings grew at a prodigious rate, running south to Sebastopol and north along the Eureka lead to Brown Hill. The Eureka lead gave its name to the Eureka stockade, the site of a miners' rebellion on 3 December 1854 against the harsh enforcement of mining taxes. The rebellion has been written about historically and fictitiously, and has given Ballarat much local and national prominence. It has been commemorated by a solemn monument at the corner of Eureka and Stawell Streets. The stockade's southern cross flag - a symbol of Austral independence - is preserved in the Ballarat art gallery. The Ballarat East gold diggings acquired a notoriety from the richness of the alluvial nuggets that were found, encouraging free-spending by the miners and attracting visiting celebrities: among the celebrities was Lola Montez, who attempted to take a whip to a publican who criticised her dancing for indecency. Her action drew larger audiences. Within three years Ballarat had an estimated population of 25,000 persons. Whilst the population was mostly male and itinerant, there were over 2000 married women. Two National schools were opened in 1853. For most of the 1850s Ballarat was a roistering place however, with many traders and storekeepers reluctant to build with enduring materials. During the late 1850s mining penetrated westwards, finding deep leads under the surveyed township. Deep sinking encouraged permanent settlement and institutions. The first permanent Anglican, Catholic and Wesleyan churches were built during 1854-58, and a mechanics' institute was opened in 1859. A hospital and a benevolent asylum were opened in 1855 and 1859. 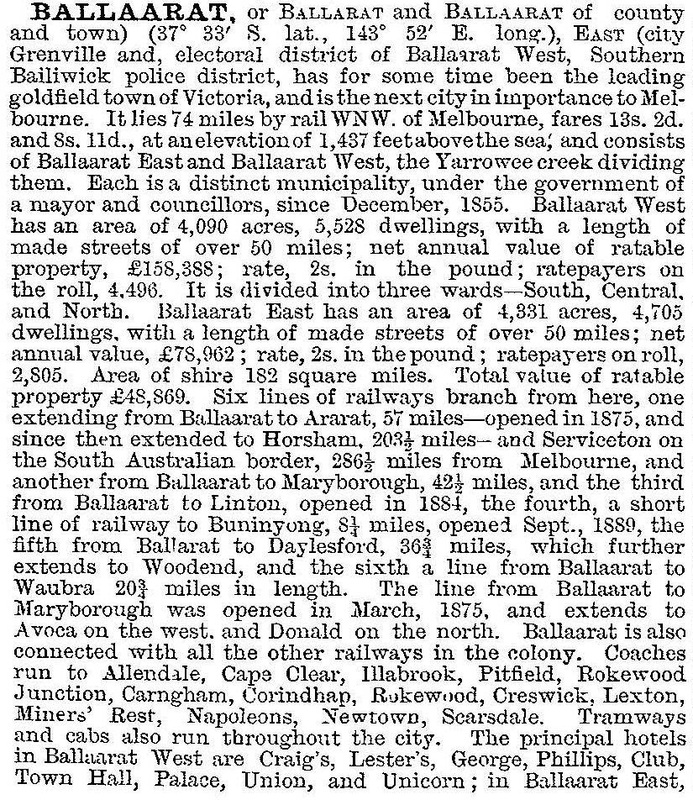 The Ballaarat (west) borough was proclaimed on 17 December 1855 and the Ballarat East borough was proclaimed on 5 May 1857. Almost immediately the former borough undertook improvements to Yuilles Swamp (Lake Wendouree), which had been dammed for water supply. Kirk's reservoir was built in 1857. A mining stock exchange began in 1858. Ballarat was connected by rail to Geelong in 1862: the direct route to Melbourne was delayed by the difficulties of surmounting the hills near Bacchus Marsh until 1889. The railway connection, however, encouraged rolling stock, and Ballarat's Pheonix foundry (1875) built over 350 locomotives before removal of the Government contract to the Newport workshops caused its closure in 1906. The railway station in Ballarat west caused shops and commerce to move away from Main Street and Ballarat East. 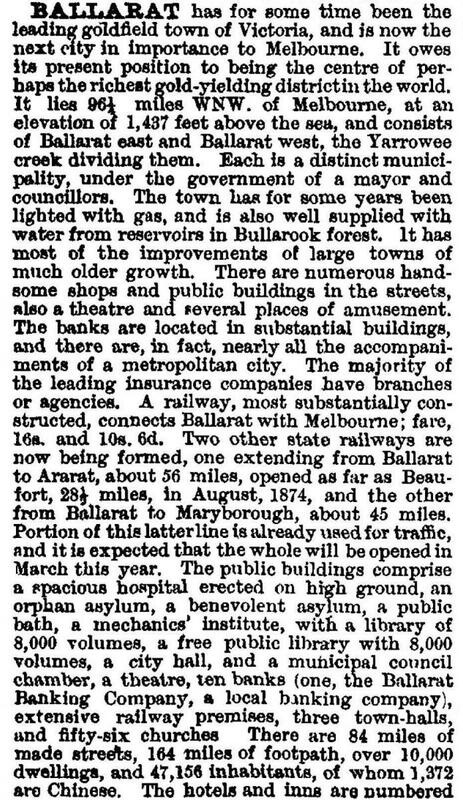 Ballarat Borough was proclaimed a city on 9 September 1870. 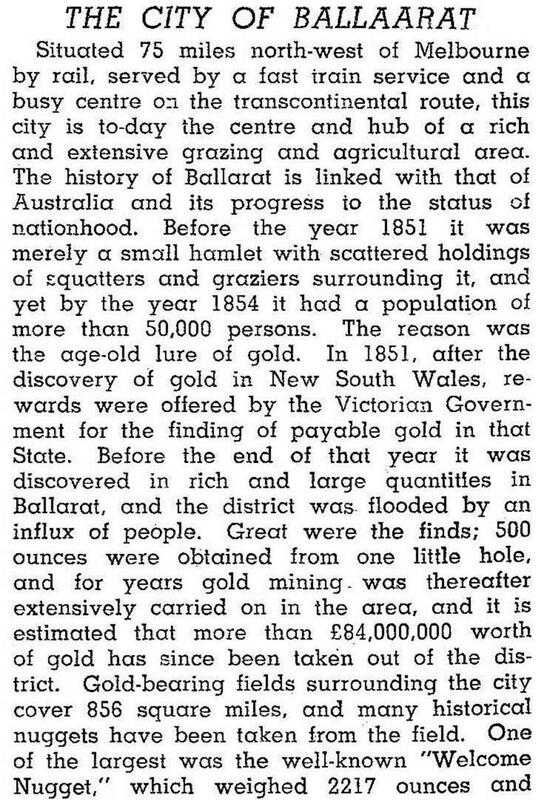 It is estimated that 4.3 million ounces of gold were mined at Ballarat during its roistering first decade, and 5 million ounces during 1861-70. The large amount in the second decade, when institutions and permanent settlement were underway, created a corpus of investment funds which underwrote future growth and prosperity. Ballarat also became a large livestock clearing centre. Foundries and workshops made pumps, agricultural implements, building hardware and domestic ironmongery. Local clay was used for bricks, pipes and other domestic goods, and the first of several woollen mills opened in 1872. 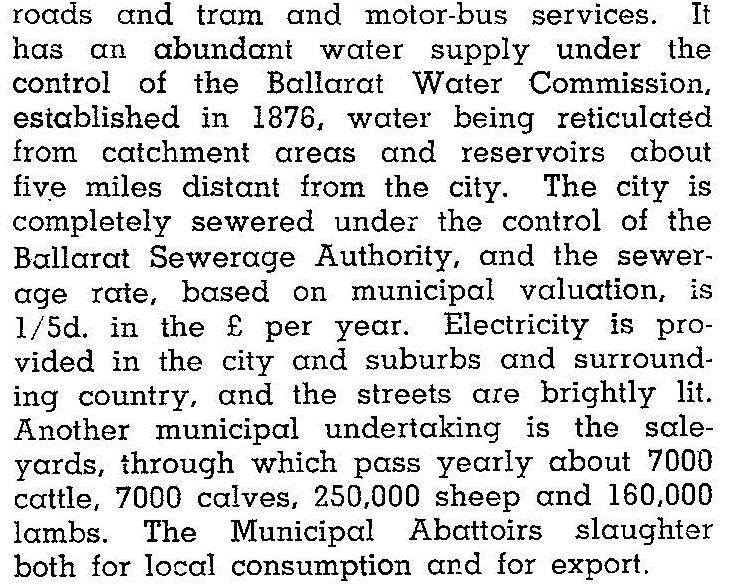 Ballarat East was situated in a gullied, flood prone area, with a large westerly hinterland suitable for grazing and expansion. Added to that, Ballarat East's early buildings were mostly of timber and calico, and when not menaced by a flood, were destroyed by fire. It became a neighbourhood for Chinese miners and prostitution, and was looked down upon. Ballaarat west gained the notable civic buildings and amenities, including the art gallery (1887), the Royal South Street Memorial Theatre (1874 and 1898), the railway station complex (1862-88), the Mining Exchange (1887), the School of Mines (1870) and even the best hotel, Craig's. Lydiard Street contains many notable buildings. Lake Wendouree was made a boating venue, and botanic gardens with glass houses and statuary were laid out on its western side. 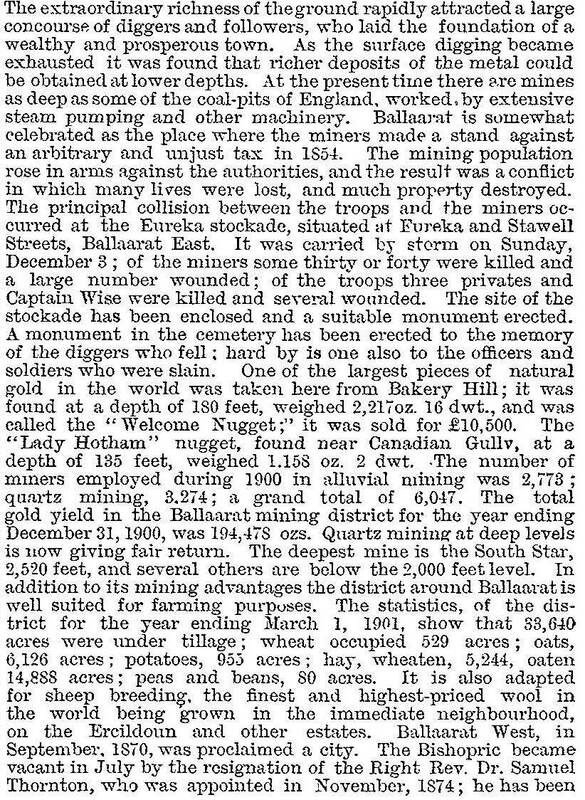 After 50 years Ballarat's mines were edging towards closure (the last one closing in 1918). Manufacturing also declined, with the closure of the Phoenix foundry (1906) and transfer of McKay's harvester works to Sunshine (Melbourne) in 1907. There were not enough new industries to take up the slack, although Elenor Lucas' lingerie factory (1888) was a notable addition. (The Lucas girls raised the money for the Arch of Victory and Avenue of Honour after World War I.) Another exception to the industrial slowdown was the electrification (1905) of Ballarat's horse-drawn trams, dating from the 1880s. 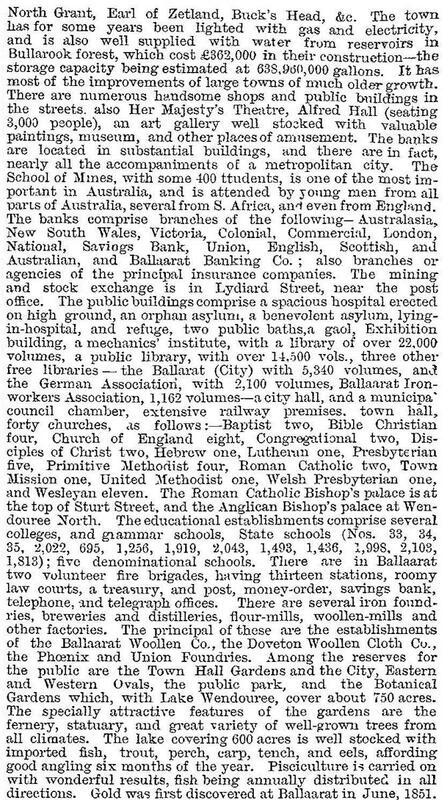 Ballarat retained a regional role in education with boarding and day students at Anglican and Catholic colleges and an enlarged School of Mines which had affiliation with Melbourne University (1887). Ballarat high school was opened in 1910 and a technical school was opened in 1913. The Ballarat Progress Association lobbied for better roads in 1914, with tourism in mind. Lake Wendouree and the gardens were a popular picnic venue, and a tram did a circuit of the lake. The Royal South Street Competition grew from a debating society in 1882. It became the national centre for band competitions and attracted thousands of competitors for choral, instrumental, elocution and vocal events. John Brownlee and Peter Dawson began their careers there. It remained the largest event in Ballarat's calendar until the 1970s. Its main venue is Her Majesty's Theatre, Lydiard Street, which the Society acquired in 1965. By then the annual Begonia Festival (1938) was an established event, and the creation of Sovereign Hill Historical Park (1970) overtook the Society for total visitation. The coming of peace brought a new wave of industrialisation and immigrant population to Ballarat. The Ballarat Paper Mill was established on the gun-cotton site (1946) and several homewares factories were opened. Ballarat Shire immediately west of Lake Wendouree, subdivided several hundred hectares of the farmers' common, attracting stoneware, caravan making, textile and metal fabrication factories. A migrant hostel was opened in 1951 and a Housing Commission estate was begun. Development was also pushed toward Mount Helen, where the school of mines secured a site in 1967 (later Ballarat University College). Metropolitan Ballarat's population grew by aboout 20% during 1947-54 to 48,000 persons and to 60,000 by 1976. As Ballarat modernised, moving inner city industries to the outskirts and advancing on, then retreating from, knocking down all the pillar verandahs, the idea of copying Swan Hill's pioneer settlement was taken up. The Sovereign Hill Historical Park was opened on 29 November 1970, on a former mining site. In 1972 the closure of the tram service removed a potential tourist attraction. Ballarat has nevertheless maximised returns from tourism, as the Western Freeway has put it within day-trip distance of Melbourne. Ballarat's well known Sovereign Hill and Eureka exhibits tend to overshadow the many registered buildings in Sturt and Lydiard Streets which form the axes of the Ballarat central conservation area. They contain Craig's Hotel, several banks, the Town Hall, the Anglican Cathedral and the railway station. The main shopping centre is in Sturt and Armstrong Streets which includes Central Square with Myer and Target department stores. Towards the periphery of Ballarat there are newer suburbs of Alfredton, Delacombe and Wendouree (westwards), Sebastopol and Mount Clear (southwards), Invermay (north) and Nerrina (north-east). Greater Ballarat's census population in 1996 was nearly 65,000 people. Its facilities serve its urban population and the surrounding region. There are two major hospitals and a large geriatric institution. There are campuses of the Australian Catholic University and the Federation University (formerly the University of Ballarat and before that the School of Mines), Anglican, Catholic and other private schools and six State secondary campuses. All principal denominations have substantial churches and there is a fine Jewish synagogue. Among the parks and sporting facilities, there is a large recreation area west of Lake Wendouree, Victoria Park south of the lake, golf courses there, north and east of the city, and several ovals near the showgrounds (north of the lake). Horse racing is held at Dowling Forest (near Miners Rest) and harness racing at Morshead Park, Sebastopol. In addition to the tourist attractions near Lake Wendouree there is Sovereign Hill and Eureka on the eastern side of the city. In 1994 Ballarat had 2524 motel and hotel bed spaces. In 2014 sixty-four wind turbines were constructed in Mount Mercer south of Ballarat to supply household power to the city. Ballaarat East was created as a borough in 1857 and made a town in 1872. Ballaarat west, named only Ballaarat, was created as a borough in 1863 and made a city in 1870. It absorbed Ballaarat East town in 1921. The censuses show how urban Ballarat's inner suburbs lost population during the 1970s while outer suburbs (in adjacent local government areas) gained population.